Bay Area city leaders and groups are forming a united front against President Donald Trump's executive orders on sanctuary cities. On Wednesday, Richmond formally announced it is taking the president to court over his executive order. The announcement was made at the same time groups in San Francisco and San Jose added their support to similar lawsuits. The groups all have the same message: Trump is violating the Constitution by threatening to revoke funds from cities who refuse to report someone to the federal government, simply for being an undocumented immigrant. 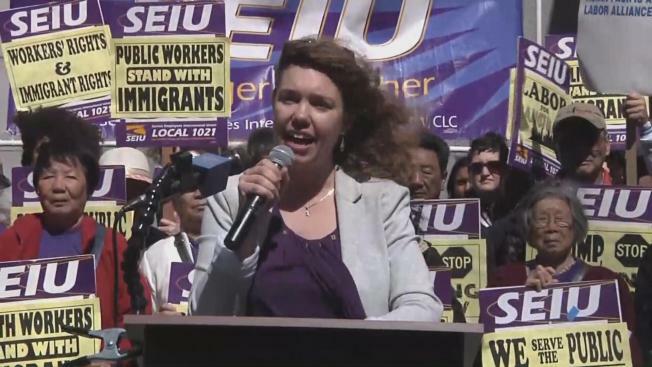 In the South Bay, more than a dozen union members and community leaders joined the fight outside the San Jose Federal Courthouse on Thursday. The groups filed what is called an amicus brief with the court in support of Santa Clara County's federal lawsuit against the Trump administration. The groups claim the president's executive order defunding so-called sanctuary cities violates protections in the US Constitution. In San Francisco, labor groups filed briefs in support of the city's lawsuit calling for a ban on the "defunding sanctuary city" order. But not everyone in the Bay Area is on board. During Richmond's formal announcement, at least one resident wanted to make sure he knew the city did not speak for him. The resident at the meeting was heard yelling "immigrants don't belong here."